Saints have made three changes for Saturday's Gallagher Premiership game at Sale Sharks (kick-off 1pm). Paul Hill, who will make his first Premiership start of the season, Api Ratuniyarawa and Luther Burrell all come in, taking the place of Ben Franks, David Ribbans and Piers Francis respectively. Franks is among the replacements, but Ribbans and Francis will play no part, having both missed a few days of training at Franklin's Gardens. Francis has been with England, while October player of the month Ribbans was battling flu last week and though he started, and impressed, against Wasps, he was given time off to recover this week. There are some fresh faces on the bench, with Francois van Wyk, Dom Barrow and Mitch Eadie ready to get some game time at the AJ Bell Stadium. Saints are without Ken Pisi (shoulder), Nafi Tuitavake (neck), Andy Symons (knee), Jamal Ford-Robinson (knee), Harry Mallinder (knee), James Haskell (ankle), Heinrich Brüssow (concussion), James Craig (concussion), Tom Emery (shoulder), Ehren Painter (back), Mike Haywood (knee) and Tom Collins (eye). Meanwhile, Sale are able to select a strong side, with world player of the year nominee Faf de Klerk lining up at scrum-half. Also in the home team’s starting 15 are two sets of brothers: Sam and Luke James, plus Rob and Jean-Luc Du Preez. For Rob, it will be his third game for the Sharks but his first at home; for Jean-Luc, it’s his debut. Josh Beaumont switches from No.8 to the second row in a pack mentored by former Saints forwards coach Dorian West. Sale Sharks: S James; Solomona, O’Connor, James, Reed; R Du Preez, De Klerk; Harrison, Webber, John; Beaumont, Phillips, Ross (c), B Curry, Du Preez. Replacements: Langdon, Bristow, Jones, Evans, Neild, Cliff, Wilkinson, Odogwu. 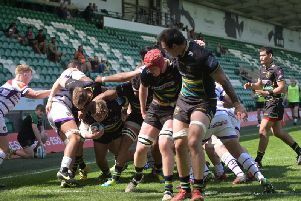 Saints: Furbank; Kellaway, Dingwall, Burrell, Naiyaravoro; Grayson, Reinach; Waller (c), Fish, Hill; Ratuniyarawa, Moon; Wood, Ludlam, Harrison. Replacements: Marshall, van Wyk, Franks, Barrow, Eadie, Gibson, Mitchell, Sleightholme.